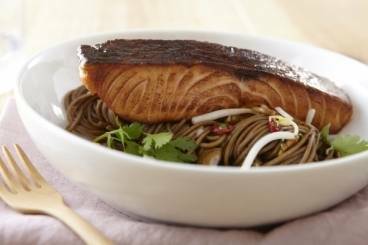 Pan-fried salmon fillet glazed with honey and served with a soba noodle salad dressed with soy sauce, lime, chilli and peanut oil. Bring a large pan of water to the boil. Add the noodles and cook for 3 minutes. Drain and wash under cold water. Chop the coriander leaves, ginger, chilli and garlic. Finely slice the spring onions. Heat a frying pan until hot and add a little peanut oil. Place the salmon in the pan and cook for a couple of minutes on each side. Reduce the heat and drain off any oil. Add the honey and coat the salmon in the honey. Remove from the pan. For the dressing: Zest and juice the lime. Mix the soy sauce , coriander, ginger, chilli, garlic, peanut oil and sugar with the lime zest and juice. Add the dressing to the noodles and stir through the bean sprouts and spring onions. Plate the noodles and place the salmon on top. Finish with a final drizzle of the soy-lime dressing.